Can YouTube Audiences Eclipse Print and Digital for Magazines? 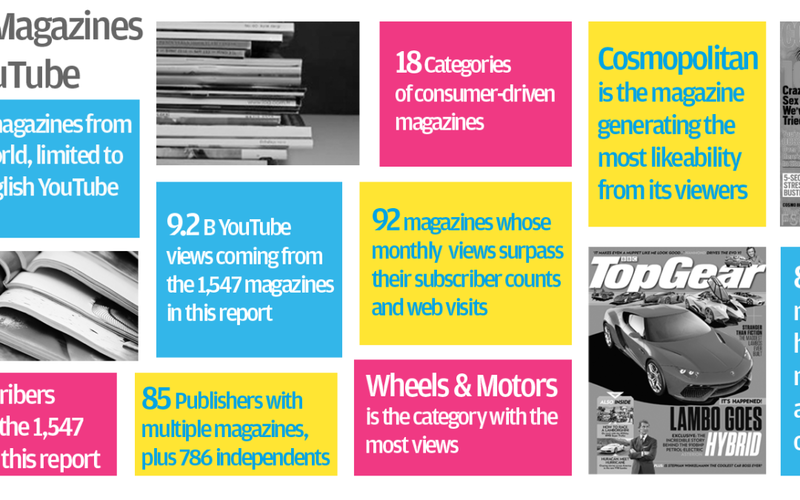 We just released our comprehensive Special YouTube Report on Consumer Magazines. The report, which pulls its data from the Touchstorm Video Index, offers some telling insights about the industry and how it’s faring in the digital age. It’s no longer enough to publish an excellent magazine and ship it out to a devoted subscriber base every month. While print subscribers are still important to consumer magazines, a new kind of subscriber matters more than ever: the YouTube subscriber. Despite the importance of YouTube, the majority of magazines have not focused on this channel. They’ve focused their efforts on app building, or upping their social media efforts, neglecting the crucial fact that YouTube is social media, possibly the most important outlet of them all. And it’s not just the editorial side of the business that can benefit from YouTube. The video platform attracts more ad dollars every year. Yet, within the Magazine Industry, YouTube is untapped by most of the publishers in the report. It’s a revenue source and an audience-building tool just sitting there waiting to be tapped. Publishers have an advantage on YouTube that other channels do not, because they are widely considered to be experts within their respective topics. They are trusted voices, there to entertain and inform, not to push products. This also leads people back to a magazine’s owned and operated properties organically. The amount of potential eyeballs on YouTube is staggering — there are more than 1 billion unique viewers on YouTube each month. It’s the perfect space for magazines to reach viewers outside of its narrow target usually reserved for print subscribers. So, who is getting it right on YouTube? Of the 1,547 magazines studied, they found that a mere 6% were able to achieve more views on their YouTube channels than their website visits and their paid circulation from January to June 2014 combined. Though 92 channels out of 1,547 is a low number, it highlights the potential that YouTube offers. Some of the magazines with robust, successful channels on YouTube include MotorTrend, National Geographic, and Seventeen. Only 8% of the magazines studied in our report show evidence of putting any effort into their YouTube channels. This isn’t limited to the Magazine Industry either. If any YouTube channels look to the 8% mentioned above as a guide, they will see that regular channel maintenance and video uploads can help them to create a bigger asset than those they sell. Generating views and revenue dollars in the digital age is not as complicated as it seems — as long as you do it right. Check out the Special Report on Consumer Magazines here.